International Plant Biotechnology Outreach of VIB and Ghent University, in collaboration with International Potato Center (CIP) conducted a 10-day course on November 4-13, 2015 in Entebbe, Uganda. The course was on regulatory and biosafety issues of agricultural biotechnology in the East-African region, with GM late blight resistant potato as the case study. 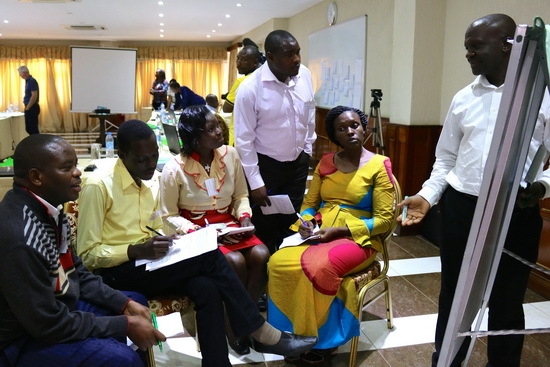 The workshop was attended by 20 participants who represented a broad spectrum of professionals – scientists, regulators, and science communicators from Uganda, Kenya, Tanzania, and Rwanda. After outlining the challenges faced by potato farmers in the East African region, ongoing crop improvement research with potential solutions for the future was presented. This part of the course was strengthened by a visit to GM banana field trials in Kawanda, Uganda. The second part of the course focused on the regulatory and risk assessment principles. Participants received a global overview of these issues, followed by specific discussions pertaining to the potato case in East Africa. The final section of the course, conducted by ISAAA AfriCenter, focused on science and risk communication and inspired the participants to discover the art of communicating scientific research to the general public. The different sessions were articulated around theoretical lectures and group exercises. The overall course was an excellent opportunity for regulators and scientists to network, discuss, and discover the different aspects related to the potential implementation of biotech crops in the African continent. The lessons learnt from the case study were very helpful. The GM late blight resistant potato was generally perceived by the participants as having great potential to benefit Ugandan farmers who largely depend on potato farming. For more details, contact Dr. Marc Heijde of VIB-International Plant Biotechnology Outreach (IPBO) at marc.heijde@vib-ugent.be.